View our emerald cut diamond engagement rings here. When the time comes to purchase that special engagement ring, you'll very likely find yourself overwhelmed by all the different styles, gems, metals, settings, and the like, no matter what your price range. Why not make it easy on yourself, and pick a lovely emerald cut diamond engagement ring? Emerald cut diamond engagement rings make a distinctive statement, because the distinguishing gem is different from the usual run of princess-cut, marquise-cut, and round-brilliants on most ladies' fingers. The stones in emerald cut diamond rings can be just as luminous and unique as those in more traditional rings, but they take the shape of a stepped, cropped rectangle - a shape more typical of emeralds. Although emeralds are among the hardest substances on Earth, they do tend to be brittle - which means that they can shatter into useless bits if they're not being treated properly. To get around this, clever jewelers invented the rectangular cut that characterizes most emerald gems today. Being the practical people they are, it wasn't long before those jewelers realized that they could apply the same cut to other stones, including diamonds; and thus emerald cut diamond engagement rings were born. In some cases, the cut used in emerald cut diamond engagement rings even retains more of the original diamond than other cuts - but you'll find that your emerald cut ring will be significantly less expensive than a ring with a marquise, round, or princess-cut ring of the same size. Why? Chalk it up to fashion. All things being equal, there's no reason why emerald cut diamond engagement rings should be less expensive than other diamond engagement rings with stones of the same carat weight. Think of it as a loss for those who turn up their noses at emerald cut diamond engagement rings - but think of it as an advantage for those of us trying to acquire a great stone at a discount price. 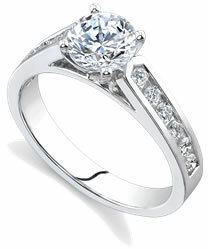 Other advantages are attributed to emerald cut diamond engagement rings as well. For example, they let you buy a larger stone for less. What would you rather have: a one-carat marquise-cut diamond engagement ring, or a 1.25 emerald cut diamond engagement ring with the same flare, color and clarity for basically the same price? Yeah, that's what we thought. Another major advantage is that with emerald cut diamond engagement rings, it's easier to spot flaws, color degradation, or poor cuts than it is with the more elaborately cut gems: the large facets make problems stand out. What's more, emerald cut diamond engagement rings look great no matter the metal you choose for the band: gold (white or yellow), platinum, silver, and even titanium. If there's one disadvantage to an emerald cut diamond engagement ring, it's that it requires a four-prong setting to keep the stone in place. Of course, you could always go with a bevel setting -- it's safer anyway. Another negative factor is that the gems on emerald cut diamond engagement rings won't return light the way a round-cut diamond will - but then, you'd have the same problem with princess, pavé, and marquise cuts, too.